Step 2: Select a Recurring day or start immediately? If you select "Choose Recurring day", you will be billed each week during the day of the week you select. If you select "start immediately", you will be billed each week based on the day to you started your meal subscription. Your subscription and payment can take a couple of hours to be processed by our team. Once we have processed your weekly subscription for delivery you will receive a welcome email from us with a link to select your meals. You will continue to receive emails from us each Wednesday morning with your meal selection link at the bottom of the email. Have special requirements? Need more meals? Want no carb meals or gluten-free only? Let us know and we will do our best to customize your meals for you. Want to skip the order the process? Would you love to get weekly savings and guaranteed meals each week even if they are sold out? The weekly meal subscription will make your meal prep service experience even more awesome! For customers who upgrade to the weekly subscription, not only are you receiving healthy meals each week without having to cook or do dishes like our normal customers but on top of that you don’t have to fill out payment information, visit our website or fill out online forms and more! In this blog post, we’ll share with you reasons to upgrade to the weekly subscription. Why should you upgrade to the weekly subscription? Bypass the order process, so you don’t have to waste time inputting shipping and payment information every week. You won't have to remember to order each week! If you're new to the meal prep game you're probably go to our website every week to place an order, change your meals and upload your payment information. The problem with this is that you're busy with work, school, the gym, family or social life and you just might forget to remember to place an order before the Friday noon deadline. By upgrading to the weekly subscription, you won't have to worry about remembering to place an order. You also won't have to experience the horrors of coming to our website on a Thursday night and seeing sold out signs, or even worse...missing the deadline entirely! By upgrading to the weekly subscription, you save on your meal plan with 5% off your meals each week and you also have access to exclusive discounts and free products. New customers don’t realize that due to the high volume of demand our meals are sold out usually by Thursday nights or Friday mornings, so for those looking to place orders (last minute) before the deadline you’ll miss out! The weekly subscription guarantees you get your meals every week. How to upgrade to the weekly meal subscription? Upgrading to the weekly subscriptions is super quick and easy. Do you want to select a Recurring day to where payments are made weekly or start immediately? In this blog post, we’ll share with you exactly how meal prep delivery work. MealFix uses a 2 day delivery system, where half of your order will arrive on Sunday morning/afternoon, and the other half will arrive on Wednesday evening. Deliveries arrive on Sundays between 8am-2pm and Wednesdays after 6pm so that you're ready to take on the week! If you live in an apartment or condo please remember to include your phone number so that our couriers can let you know when your delivery arrives. Please also make sure that your concierge accepts food deliveries and notifies you on arrival. This schedule is an approximation and does not take into consideration weather conditions and traffic due to accidents, road closures, or city events. Please bear with us if your order is not delivered within this delivery window as we are trying to get your order to you as quickly as possible! On checkout here's where you leave special delivery instructions for our courier. Orders are delivered on Sundays and Wednesdays. Meals are delivered in a cooler bag but you can leave a cooler outside your door for couriers to leave the bag inside if you will be away from your home for more than 3 hours. On each delivery day you can leave your cooler bag with ice packs outside of your door for our courier to pick up. CAN MEALFIX DELIVER TO MY WORKPLACE? Yes we can, just be sure to include your workplace address as the shipping address, select the call on arrival delivery option, and include clear instructions for parking and entering your workplace. Please ensure that your workplace is open during the specified delivery windows. WHAT IF I'M NOT HOME WHEN MY DELIVERY ARRIVES? MealFix drops your deliveries to your door. If you are not home we can leave the cooler bag on your doorstep or with your concierge. Please ensure that your concierge accepts food. If you live in a condo or apartment building that does not have a concierge please try to be home during the delivery window. DO I NEED TO TIP THE DELIVERY PERSON? No, you don't need to tip your delivery person, tips are not expected. Refrigerate immediately. The recommended refrigerator temperature is between 1 and 4 degrees celsius. WHAT DO I DO WITH THE EMPTY COOLER BAG? Cooler bags and ice packs will be picked up on the next delivery, sanitized and reused to package meals. Simply leave the cooler bag outside your door or with your concierge on Sunday. If you do not plan to reorder with MealFix we can schedule a pick-up. Returning cooler bags helps MealFix keep costs low for our customers! Empty meal containers and canning jars do not need to be returned and can be recycled! For more info on mealfixcanada.com go their website www.mealfixcanada.com. If you have any questions email, info@mealficanada.com and a member of their team will talk with you to answer any questions you have or to help you get started. This blog post is about to make your life a whole lot easier. If you find yourself being busy all the time with no time to prepare healthy meals before or after work, you need to read this. Coming back from work you’re exhausted, and the last thing you want to think about is coming home and cooking. Most people want to use those few hours left in their day as leisure time to wind down, relax and rejuvenate. Others might want to use that extra time to work on side projects and hobbies. Many people in Toronto and the Greater Toronto Area are now taking advantage of meal preparation services as a quick and easy alternative. Saving people time from cooking, eliminating having to wash dishes and doing groceries! Its also making them healthier and more productive at work and allowing them to get more leisure time in with friends and family. In this blog post, we’ll share with you exactly how meal prep services work so you can quickly and easily incorporate it into your lifestyle. We’ll break down everything from the different type of meal prep services that exist, how to go about selecting your meals, what portion size and pricing is right for you, and the best part, how delivery works. There are many meal prep services but not every meal prep service is the best fit for you. There's everything from vegan, paleo diet, low-carb diet, weight loss, weight maintenance services and more. Be sure to check that the meal prep service company you select fits with your nutrition goals. If delivery dates are important to you, you might want to look into which meal prep companies deliver on the days of the week you prefer. If you're tight on a budget, you may want to compare prices to see which meal prep company fits within your budget. 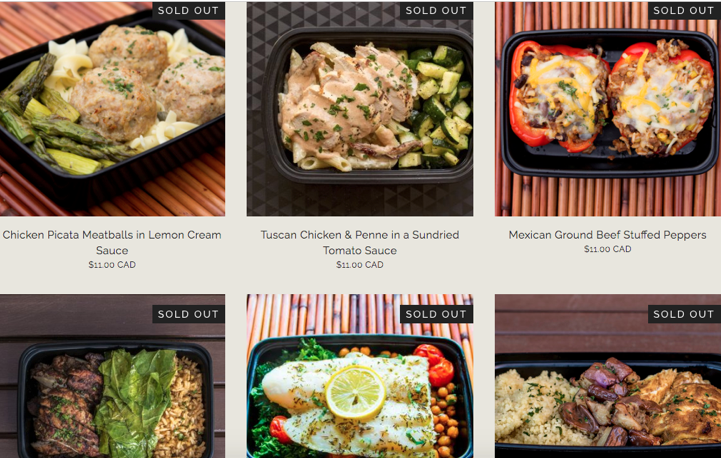 Some meal prep service companies have gluten-free, vegan, nut-free, and halal options. Always check with the company if they can make accommodations according to your dietary needs or restrictions. For halal options, you can always check with the company’s supplier to confirm that they are serving halal meat. The quality of the meals differ for each company as well, so you may want to try out a few companies to see which best fits your tastes and preferences. MealFix Canada is a fast-growing meal prep service that caters to anybody looking for a healthy and affordable option. MealFix Canada is offering 20% off their first order so you can get started with their promo code PREP20. You'll want to check portion sizes to ensure meals are the right size for your daily needs. Most meal prep companies may increase portion sizes or protein options, and reduce or completely remove carbs. Some meal prep services will provide you with a portion size that's much smaller or larger than advertised, so always double check the company’s website to make sure it meets your portion requirements. Nutritional values are usually located at the front or back of the packaging. If its not listed on the packaging you should be able to find it on the companies website, usually under the menu page. You don't want to be eating the same meals all the time, do you? You’re probably wondering how often the menu changes? Wondering which proteins are offered? Or if there are different options to choose from versus a set or rotating menu? Some companies change their menu every 2-4 weeks, and some rotate between their menu every other week. Some companies also have a set menu containing pork, beef, and seafood, whereas others give you the flexibility to choose the type of proteins you want. If you're looking to add variety to your diet, you can check the company’s website for the dietary options or ask how often they change their menu. Meal prep companies can range in pricing for individual meals and packages, so it’s important to check which meal prep company fits within your budget. Compare your weekly grocery bill to the cost of the meal delivery service and don’t forget to factor in the price of the convenience of receiving premade gourmet meals to ensure the meal prep service is worth it for you! Typically, the per meal price goes down the more meals you order. Many meal prep companies are subscription-based which means you're automatically billed weekly for utilizing their services each week. MealFix Canada is an option that gives customers the ability to either place a one-time order or sign up for a weekly subscription depending on their week-to-week needs. It is also essential to research delivery fees. Some companies charge per order and some charge for each delivery, which can be up to two or three times per week. Delivery fees for each delivery throughout the week can add up and be a hefty price to pay on a weekly basis. When selecting your meals choose the package that fits your weekly needs. Try a week’s worth of meals to get the full meal prep service experience. There’s nothing better than coming home after a long day to a premade, proportioned meal that is ready to eat. MealFix Canada offers a 7 meal, 10, meal, and 14 meal package as well as a 5 meal breakfast package. If you’re looking to test out the meal service or purchase the smallest amount of meals for the week the 7 meal plan is the best option. If you're looking for both lunch and dinner for weekdays only, you’ll want to do the 10 meal package. If you're super busy and looking for both lunch and dinner for an entire week, you 'll want to try the 14 meal option, and if you need a bit of a top up with breakfast and snacks you can add either the breakfast package or individual items to your meals. Deliveries are typically split into two batches with most companies delivering on either Sunday and Wednesday or Monday and Thursday. There is usually a weekly order deadline to submit your order so that meal prep companies can get the ingredients they need to prepare your meals on time for delivery. It’s essential to check the dates of delivery that fit with your routine. Monday and Thursday delivery can be problematic. Monday is a hectic day of the week when you need your meals the most. Some companies deliver on Monday evenings which can be highly inconvenient because you may need lunch or dinner for that day. On Thursday you get the other half of your order which you're supposed to consume over Friday and the weekend, however, it’s a lot harder to stick to meal prepped meals with family and social events ramping up. For more info on MealFix Canada go their website www.MealFixCanada.com/faq or view their menu and pricing at www.MealFixCanada.com/menu. Try out MealFix Canada's meal preparation service by using the promo code PREP20 for 20% off your first order. If you have any questions you can also email info@mealfixcanada.com and their friendly staff will help you with any questions you have or help you get started. Hope this helped you on your meal prep journey! Email us at info@mealfixcanada.com with any questions you have about our meals or delivery.